I've just seen this. You better keep those tissues within reach because if you have a heart it will no doubt be broken when the opera is finished. It's good - very good in my opinion. I'm not as much into opera movies as I am into live performances from the stage, but this one is magical. The setting is traditional but not run of the mill, Villazon and Netrebko are in fine voice (Villazon is outstanding in fact), Netrebko is drop dead gorgeous and the acting is superb. Also - it's often the case in opera movies that you can see that they are not really singing. Even if they get the lip synching right it's clear that they aren't singing for real because you can't see the effort it takes to sing like that. No such problems here. They have actually shot some of the scenes with Netrebko and Villazon singing live while filming took place. So it's all good really. I like it - no, let me rephrase that - I LOVE it anyway. Last edited by jhar26; Dec-25-2010 at 13:58. Also - it's often the case in opera movies that you can see that they are not really singing. Even if they get the lip synching right it's clear that they aren't singing for real because you can't see the effort it takes to sing like that. No such problems here. They have actually shot some of the scenes with Netrebko and Villazon singing live while filming took place. This was the aspect that worried me most - I knew I wouldn't be able to believe in the performance if they didn't seem to be really singing, but it seems that my only reservation is answered. It goes on my list. Thanks Gaston. Last edited by jhar26; Dec-25-2010 at 14:00. Watched the first half of this yesterday. My goodness, what an emotional experience this is - and the most weepy bits are still to come! Almost full marks, so far. In particular unreserved full marks for Villazon who is simply tremendous in this - truly outstanding. In fact, for me, he makes Netrebko seem a bit bland by comparison (though I'm not a particular fan of hers, anyway). Certainly it's Villazon's voice that is still echoing around my head this morning. 1. The synchronising between lip movements and voices isn't always entirely convincing. 2. The outdoor street scenes look very like a movie set (which they obviously are), as opposed to the interiors, which look much more natural. The result, although very beautiful, seems lacking in a certain unity. 3. Much of the falling snow looks computer-generated to me. Maybe it isn't (in which case I accept the egg on my face), but I find myself not really believing in those snowflakes as they drift around. 4. The widescreen format is fine for a movie in a cinema at full scale, but I've never felt comfortable with it on the small scale of a TV, and most particularly with this opera, on its intimate scale, it doesn't feel right - it induces a sort of claustrophobia, as if the ceiling is always too low, or something. But I'm now feeling guilty talking about such minutiae, when the overall experience is so positive. This will get watched again and again. 95/100. Star rating (out of five): four and three quarters. I think it's as pretty as a Christmas postcard. I agree that Villazon is brilliant, vocally maybe the best Rodolfo since Pavarotti and he's a much better actor. I like Netrebko too - she and Villazon always have great chemistry. They were born for each other really - like Fred & Ginger. Her interpretation is different from Freni's, but valid in my opinion. Freni's Mimi is a sweet and innocent girl - Netrebko's is more a 'woman of the world' so to speak, albeit one with a heart of gold. Last edited by jhar26; Dec-25-2010 at 14:02. I can imagine. I'm stacking up boxes of tissues for that. I think there may be two types of snow - the 'real' fake snow, on the ground; and computer generated falling flakes - particularly noticeable in the extreme foreground in closeups. I don't care, by the way, how they fake their snow! I just couldn't help wondering about it at times, as I watched. Well, I've sobbed my way to the end now. I think I can safely say that anyone who has a soft spot for La Boheme is going to be very, very satisfied by this. I still think, after seeing/hearing all of it, that Villazon is the real show-stealer. His singing is all I could hope for, and more; and his acting is fascinating - he continually adopts little gestures and expressions that are entirely convincing and natural. The atmosphere of the production throughout is really gorgeous. I'll look out for that (haven't watched the extras yet) and check out its impact on my hypothesis! Last edited by jhar26; Dec-25-2010 at 14:03. 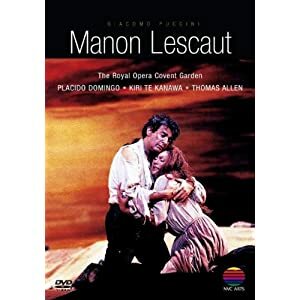 Yesterday I saw on met player the Manon Lescaut with Domingo and Scotto that's also available on DVD. It's comparable to the one with Kiri and Domingo, both in terms of production and overall quality. I slightly prefer the singers in the minor roles on the Domingo/Kiri DVD and Te Kanawa definitely has a much prettier voice than Renata Scotto, even more so at this point of their respective careers. But Scotto is a good actress and her act four performance especially was so convincing that she made up for it and gave me shivers up and down my spine. Act three was also very intense, maybe even more so than on the Domingo/Kiri DVD. BTW - that third act ranks with the best of Puccini's work in my opinion. In fact, one could argue that dramatically speaking the end of act three would also be the perfect end for the opera. How do they end up in that desert anyway? But anyway - I would call the Covent Garden Domingo/Kiri/Sinopoli vs Met Domingo/Scotto/Levine match-up a draw, meaning that both are very good. Last edited by jhar26; Dec-26-2010 at 20:25. 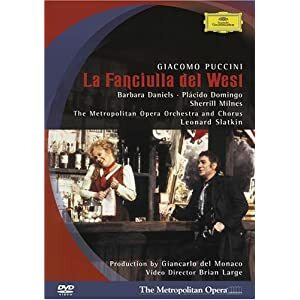 Love this opera, particularly Minnie (Barbara Daniels). It's great to have such a strong female character who actually gets her man instead of dying! I slightly prefer the singers in the minor roles on the Domingo/Kiri DVD and Te Kanawa definitely has a much prettier voice than Renata Scotto, even more so at this point of their respective careers. I agree with jhar26 about the minor roles (especially Thomas Allen) - in fact having watched the two DVDs in quick succession I think this is a better production overall; the actors, especially in the crowd scenes, are more effectively staged, the sets and costumes are more attractive and the singing and the acting are better. Kiri was dynamite in the last two acts and you could really believe in Manon and des Grieux's love. Fantastic! Started the Netrebko-Villazon La Boheme. I hate to buy into the hype but this is damn good. Buy into the hype my friend. If it's good it's good, and this one definitely is good - very good actually. Don't you love those times when something catches you unawares and against your expectations turns out to be something really special? 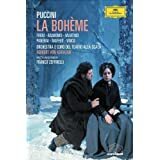 The background: my introduction to Puccini in the 70s was via the near-miraculous recording of La Boheme with Pavarotti, Freni, and Karajan (on vinyl originally). For a very long time it was all I had, and I didn't feel the need for any other version. Boheme has been my favourite, most-loved, most-listened-to opera for more than 30 years. I couldn't imagine a better performance, and Pavarotti and Mirella just were Rodolfo and Mimi, so that was that. In due course the vinyl set was replaced by the CD set, and when eventually I did add a new version, it was the slightly earlier (and entirely magical) live recording with Pavarotti and Mirella, this time under Schippers. I've seen two live Bohemes, one sort of OK-ish, the other dreadful. It was only quite recently that I bought one on DVD (the Villazon/Netrebko movie). And jolly good it is, too - but mostly I just didn't want my imagined pictures spoiling, having built them up over so many years. I knew about the 1980s Pav/Freni DVD but didn't really want to see an old Rodolfo and Mimi. I knew about the 1965 Zeffirelli movie but thought it would be too creaky and in any case Pav wasn't in it. But the other day I ordered the '65 Zeffirelli movie (see posts above). It arrived this morning. I couldn't resist just slipping it into the player, you know, just to see.... But first, I gave myself a stiff talking to. Expect the sound to be bad, I said. Expect all sorts of audio/visual clunkiness. Expect dodgy lip-synching. Expect to be disappointed. Now, press the button. I thought it started well, but from the moment Mimi appeared at the door I was in tears. From that point on I sobbed my way through Act 1. I'd imagined Mirella as Mimi for so long - I even had a photo of her as Mimi (see posts above) - but I was quite unprepared for the actuality. My goodness - her eyes!!! The smile!!! It's not surprising Rodolfo is hooked so fast - who wouldn't be? And her singing - there's something about her singing that I can't define but which seems to encapsulate everything that Mimi is. Lip-synch problems? Yes, they're there. Do they matter? Hardly at all. I found I could just dismiss them from my attention. By the end of Act 1 I was quite literally sobbing into a wet handkerchief, and I switched it off. Discussed the whole business with my wife, and we're going to have a La Boheme 'special' evening tomorrow: fish and chips brought in from the local chippy (we rarely do that these days), a bottle of wine, and Mirella. We all have our favourites, and I'm not in any way suggesting that in some objective sense this is 'the best'. I haven't even seen the rest of it yet. But I've never been so moved by an opera on TV before. I've never cared so little about technical limitations. I've never bought a DVD that I think I'm going to love so much as this one. May I ask for opinions again please? Is this the Manon Lescaut to get? (Bearing in mind that I'm not interested in an updated production). May I ask for opinions again please? Is this the Manon Lescaut to get? All times are GMT +1. The current date and time is Apr-24-2019 23:44.